Peter Gotcher is Executive Chairman of Dolby Laboratories and Chairman of Topspin Media, Inc. He founded Digidesign Inc. in 1984 and served as its President, CEO and Chairman. He won a Grammy (2000) and an Oscar (2004): both were for Technical Achievement and honored Digidesign’s contributions to the recording and film industries. In the late 1990s, Gotcher became a founding partner at Redpoint Ventures of Menlo Park, California, a leading Silicon Valley technology venture capital firm. He has served on the board of directors of fifteen public and private companies, including Line6, Avnera, Dash Navigation, Zing Systems, and Pandora. Peter has a BA degree from the University of California at Berkeley and is member of the Board of Trustees at the Berklee College of Music. The interview starts by looking back at Gotcher’s earlier achievements but quickly turns to the current juncture and his direct involvement with Pandora and Topsin. Gotcher also touches on Daisy, a new streaming service that will launch later this year and which we write about at more length later in this issue. MBJ: How did ProTools become the standard for recording and music production? Peter Gotcher: I started Digidesign with Evan Brooks in 1983 and we were not into recording systems. Our products were digitized drum and percussion sounds on chips that could be put into drum computers to make them sound better. When digital sampling keyboards and the Macintosh came along, things took off. The Mac was the first personal computer that could display a waveform, and our sound editing capabilities evolved dramatically. Today, ProTools has many components: the main application, different audio interfaces, and a universe of third party plugins. But it all goes back to having a visual waveform that you can edit and a traditional mixer element; to this day most of the work in ProTools happens there. There doesn’t seem to be a new paradigm to rethink how we record, edit, and process audio yet. Still, much innovation is happening in the world of virtual instruments and plugins. MBJ: How do you remember the transition into Wall Street? PG: Digidesign went public in 1993. I was in my early thirties and pretty terrified because I was the youngest CEO of a public company at the time we went public. I would argue that there was a short transitional period of time where I kind of dropped the ball. Going public really limited the amount of time I could stay focused on the product side of the company. I was in effect its Senior Product Manager, although I didn’t necessarily write code or design the hardware. Now there were many new activities to spend time on, and investor relations needed work early on. The IPO roadshow itself was about fifty meetings and fifty presentations over a couple of weeks. Fortunately, I had mentors among my board members; one of them was a CEO of a publicly traded company and there were several with deep business experience. MBJ: You are also known as the founder of Topspin, a software-marketing company, especially for new artists. PG: I was on the board of a company named MusicMatch whose software was bundled with the iPod for Windows before Apple came out with a Windows version of iTunes. The company had about twenty million users but its search engine tended to recommend artists that were already popular. I was wrestling with a question: how does a new artist get traction with a search engine and get recommended sooner rather than later? I had spent time and brainstormed this topic with Shamal Ranasinghe, so I hired him. MusicMatch went with it, and we spun an early version of Topspin there. But Yahoo later acquired MusicMatch and did not follow through. At the time, the concept was based around targeted marketing for new artists, including the identification of strong correlations with symbiotic artists for purposes of reaching more fans. But we were now free from Yahoo and could get behind a broader mission, and this became “let’s just let artists go direct to fans and offer an alternative to the traditional label structure.” Shamal really deserves credit for keeping the idea going and restarting the new Topsin. I provided some seed funding with him as a co-founder. After that, we hired a small team of about five or six people. We ended up raising several rounds of venture capital and the company is doing well. MBJ: Can you tell us a little bit about Topspin since CEO Ian Roger’s departure? PG: Ian is going to run a project called Daisy, which is a new on demand music service. He’s staying involved with Topspin and has become the chairman of the board. He’s actually taking my place in that role. He has been a fantastic evangelist for the company and we feel that in his role at Daisy he is going to have so much artist interaction – and Topspin will be integrated into Daisy – that it will probably continue to promote Topspin’s interests as well. I would defer to Ian to give you the full story, but what they are trying to do differently with Daisy is to both allow artists to manage their presence and profile pages, and to make offers directly within the service. Today, if you are on another music service and you click on the artist’s bio, you typically get some pretty stale info that they’ve licensed from the All Music Guide or one of those other data sources. Many of the postings are old. A better alternative is to let artists claim their space on the service by uploading pictures and videos, making comments, and placing their own Topspin offers as well. MBJ: Daisy will be a streaming service. Are you bullish about the medium? PG: Yes. I’m a believer that streaming is the way of the future and that downloads are probably just a transitional format, and probably won’t last a full thirty-year cycle like others have. Streaming is where the big audiences are; think about terrestrial radio: its audience went out to the record stores and bought CDs and even with a fairly low conversion rate it made a difference. The economics of streaming are, of course, challenging. Look at Pandora being basically break-even and Spotify losing many tens of millions of dollars; artists, on the other hand, complain about the size of their payouts from such services. But also, expectations of how much, when and if you pay for music have just really changed dramatically. The root of all this is the unbundling of the album and the establishment of the single song economy. In my view, fighting piracy is like trying to get toothpaste back in the tube. MBJ: Do you think there is room for both Pandora and Daisy? MBJ: Please compare Pandora and Spotify for us. Are Pandora’s programming methods more reliant on the human touch? PG: Well it’s a mix. There’s the Music Genome Project, which is made of trained music analysts who listen to the music and capture all kinds of “genes” as we call them, i.e. the traits of the music. That’s the starting point. Then, we also have so many users that we have billions of these “thumbs up” and “thumbs down” events. So we use that as well. And Pandora’s primary focus is “let’s build the best possible playlists for you.” That’s where a lot of our R&D goes. The user interface of Pandora hasn’t really changed all that much. We want to keep it simple. But a lot of the innovation is happening under the hood – trying to make the playlists better and better. That seems to trump everything else in terms of driving user engagement and satisfaction. Besides, the services are different. Spotify is an on-demand service. Pandora can’t do on-demand under the terms of its statutory license. When you look at music-listening habits, about 80% of music listening is passive meaning it’s radio and you’re not picking every track. In the case of Spotify, you can do that. And there are a lot of passionate music fans that want to have a completely active experience and pick every track they hear. But that’s really only about 20% of listening. A lot of people have asked, “well why don’t you just have a subscription ad-on that is a track-on-demand product?” And we just feel like that’s been done fairly well and that we really do access a large enough market. MBJ: Pandora is offered in the U.S., New Zealand, and Australia. Why does it seem to be running into problems elsewhere? PG: Almost none of the countries outside the U.S. have statutory licenses for Internet radio, although Canada may get there soon. From day #1, Pandora could play any artist. We just had to pay the statutory royalties to SoundExchange. Like terrestrial radio, no artist can tell us that we can’t play their songs. The royalties are fixed. We tried very hard, for example, to launch in the U.K. and we had to do direct deals with every label and every publisher; they are incredibly fragmented. It really is very challenging to pull off something like Pandora unless you can operate under a statutory license. We’re hoping that the way we do business in the U.S will be the logical evolutionary path for these other countries because it makes sense, but it’s an element that we don’t control. MBJ: If licensing costs continue to be as high as they are, is Pandora’s business model viable? PG: Well, increases are kicking in. We had one in January and we will have another one next year. At the end of the day, Pandora will survive if we do a really great job of selling advertising – primarily mobile – and we continue to make our subscription offerings better. I don’t think we’re waving the flag that “Pandora’s going out of business if we don’t get lower royalties”. We did that three or four years ago because royalties then would have put us out of business in pretty short order. Fortunately, that changed, but the revisions are still tough for us to take. Pandora’s survival is not at risk. We’re a much less valuable business with high royalties but that’s not the end of the world. I believe that the high royalty rates are stifling innovation and preventing Pandora’s competitors from being funded. 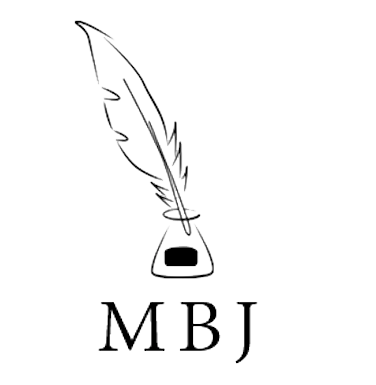 MBJ: Could you please elaborate? Most V.C.s that understand the online space look at Pandora’s cost of content and say, “we can’t build a business at that level.” You can’t do subscription-only radio and get more than a few hundred thousand subscribers. That’s been tried. I think the reality of it is that radio, as it has been for many decades, needs to be free and ad-supported. Or at least have free and ad-supported components. And these royalty rates and the challenges of scaling an ad-sales organization make it an un-investable area. David Pakman, the former CEO of eMusic, is a person who has a ton of domain expertise, experience and knowledge. Pakman was pretty articulately at the arbitration hearings. He knows the music-licensing world very well and went on to become a V.C. He made a very clear case about why new Internet radio companies are un-investable. I suppose you could look through one lens and say, “maybe that’s good for Pandora – keeping competition out of the market,” but I think it’s just bad for fans, artists, and innovation. More participants make a healthier market. Now if the rates actually went up in 2015, that could be catastrophic but I don’t think anybody is predicting that. MBJ: How do you see the market for new music business startups? What are you looking for as an investor? PG: The truth is that the category is becoming overcrowded and generally less attractive from a financial investment standpoint. There’s no shortage of entrepreneurial creativity. People are coming up with a lot of interesting ideas. But, there are all the content licensing issues, whether it is statutory royalties or the realities of having to do content deals directly with the labels. That’s a tremendous risk factor in starting a new digital music service. Now in the case of Daisy, they are very well funded by a very successful business, Beats. They are going to try to take a different tack. And they are going to have all the benefits of the celebrity marketing muscle that Beats can bring to the game. They are not funded by traditional V.C.s. My advice is, if you want to do a fundable music startup, the key is to stay away from requiring direct content licenses from labels. The whole transition of this industry to direct-to-fan is happening more slowly than any of us would like but I’m still a firm believer that it will happen. There will be continuing opportunities for companies that facilitate that transition. There are some new music startups that I consider particularly interesting. For instance, Chromatik is a music education network and system for music teachers to interact with their students remotely. 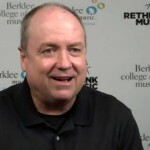 But what I’m most excited about in the online space is the stuff we’re doing at Berklee Music and the Coursera courses. 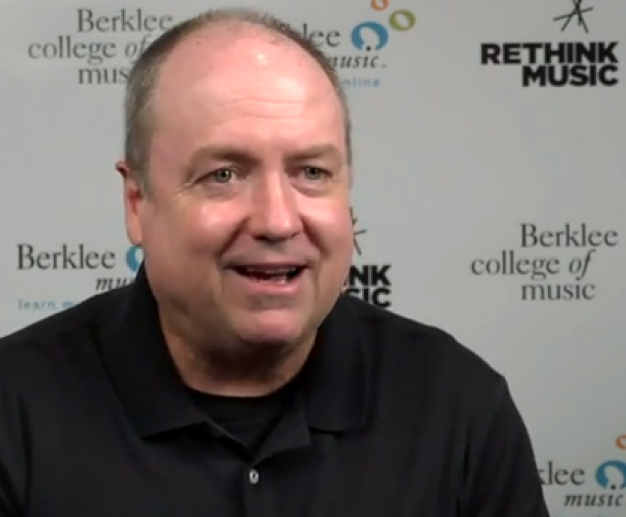 (Editor’s note: Gotcher is also a Berklee Trustee). Berklee obviously has some credible faculty and curricula being developed all over the world. At Coursera, we’re able to give that away for free. I think there are 125,000 people signed up right now for those classes. And that’s good business, because it will be a driver for both the online and the brick and mortar school. MBJ: What about music and the venture capital market? Gotcher: There’s sort of a climate of “haves” and have-nots” in a lot of venture-funded companies today. V.C.s and angels are doing more seed investing, with many companies getting some level of early stage funding. But there’s always been a high mortality rate of companies going from seed funding to doing a real series A financing. And it seems that today, especially, there will not be enough series A rounds for most of them. But at the other end of the spectrum, you see a company like Spotify, which has obviously generated a fair amount of market traction while losing a substantial amount of money – they reputably raised another $100 million dollars at a $3 billion valuation. It’s almost as if there a few hot companies that get very high valuations but it’s a struggle for everybody else. Series B and series C financing rounds are not as buoyant as they have been in the past. MBJ: You recently joined the board at Trion. Why did you choose to invest in a video game company? But as I look back over the last few years, a couple of my boys have become interested in massive multi-player strategy games. In these games an ad-hoc team is formed with people from all over the world. They collaborate to solve pretty complicated problems. So a light went off in my mind. I think I also heard a TED talk on the topic. I now believe this collaborative game dynamic is going to be ingrained in the behavior and culture of their generation, and inform problem solving moving forward. When the V.C. investors at Trion approached me and asked me to join their board, my first reaction was “well, I don’t know anything about the gaming industry, I’m not a gamer, you don’t want me.” Their response was “well, we have a lot of gaming experts and you have had success in other entertainment and media related businesses, and we think we could benefit from those perspectives.” We talked about it for a long time and I finally joined. I’m learning a ton about this industry. It’s living up to my expectations that it’s going to be a fascinating area to watch. Do you know how to contact peter gotcher?